But for hay fever sufferers, spring means pollen - especially grass pollen. This can trigger serious allergies in many, and in rare cases can be fatal. For hay fever sufferers and asthmatics, the Melbourne Pollen Count is an indispensable resource to help manage their symptoms and protect their health. The University of Melbourne has been collecting grass pollen data for more than 20 years and, from the start of October through to the end of December, provides daily grass pollen forecasts. Many people at risk of hay fever or asthma check the forecast so they can take preventative measures, like taking antihistamines, or staying indoors. Associate Professor Newbigin, who leads the Melbourne Pollen Count team, says it is hard to estimate the hay fever outlook for the coming pollen season because it is so dependent on local weather conditions, but the weather over winter offers an indication of how much grass there is likely to be. "Winter has been drier and warmer than average, which means it will probably be a pretty poor grass pollen season," he says. Good news for hay fever sufferers, but it comes with a proviso. "Last year we thought it would be an average grass pollen year, and it was," says Associate Professor Newbigin. "Except for that one period in late November, with thunderstorm asthma." Around 5:30 pm on November 21, 2016, a line of thunderstorms and showers that moved eastwards across Melbourne brought the health risks from hay fever and asthma into stark relief. Thunderstorm asthma is thought to be triggered by a unique combination of high grass pollen levels and a certain type of thunderstorm. Grass pollen grains get swept up in the wind and carried for long distances. Pollen can break up and release tiny particles that are concentrated in the wind gusts that come just before a thunderstorm. These particles are small enough to be inhaled deep into the lungs and can trigger asthma symptoms, making it difficult to breathe. Nine deaths have reportedly been associated with last year's thunderstorm asthma event. At the time, hospitals, ambulance services and the health system generally was overwhelmed by thousands of people suffering severe asthma attacks. Some of these people had never previously suffered an asthma attack, although they typically suffered from hay fever and were allergic to grass pollen. "This was the worst thunderstorm asthma event ever, anywhere in the world, as far as we know," says Associate Professor Newbigin. "Every single ambulance in the state was on the road that night." As bad as November 21 was, it was far from Victoria's first experience of thunderstorm asthma. Dr Jeremy Silver, an atmospheric modeller in the School of Earth Sciences at the University of Melbourne, has been analysing historical asthma presentation data in Victoria. "In Melbourne, we've identified at least six thunderstorm asthma events over the last 33 years," he says. Thunderstorm asthma usually occurs between late October and the end of November and is almost always associated with high grass pollen levels in the air. "During these events we can see that there is a sharp spike in the number of people turning up at hospitals with asthma. This happens in Melbourne and in some of the regional hospitals, and is particularly bad in the north of the state," he says. But Dr Silver says the data is complicated. "There is more to thunderstorm asthma than just grass pollen. It is certainly a contributing factor, but there are plenty of days with high grass pollen levels without an asthma spike, and some high asthma days with low grass pollen levels," he says. The Victorian State Government has since committed AUD$15 million to develop a monitoring system to forecast thunderstorm asthma events so that hospitals, emergency services and those at risk of an attack can be informed. But he adds that people should heed any warnings, as ignoring them could be fatal. 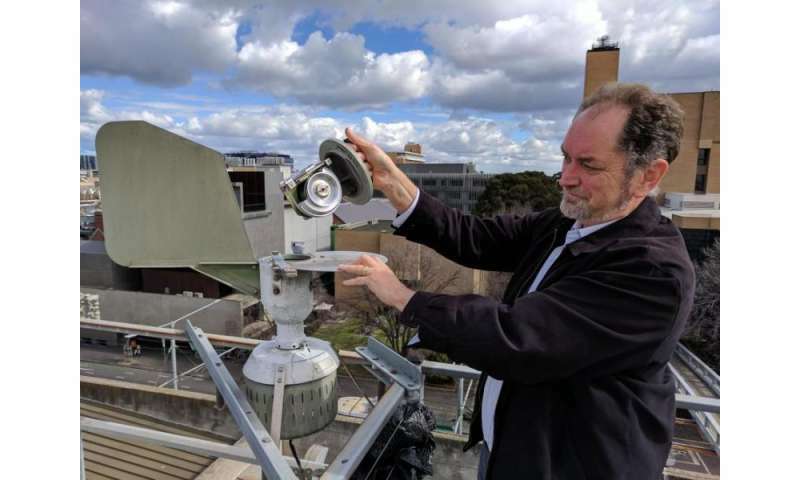 Importantly, the state government is also funding five new pollen counting stations that will be sited around rural Victoria and add to the existing station at the University of Melbourne, on top of the Earth Sciences building at its Parkville campus. How is your hay fever today? Every since Dr Edwin Lampugnani joined the School of BioSciences in 2011 and saw the potential of the grass pollen data the University was collecting, the Melbourne Pollen Count team has provided a daily count and forecast of levels in the air. 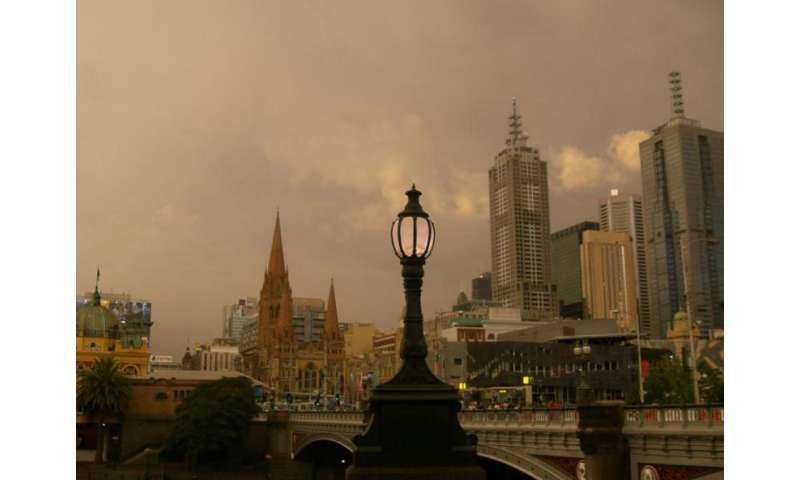 Not only does the Melbourne Pollen Count provide crucial data to the community, it is also a citizen science project, with users submitting daily information about their symptoms that are then used more clearly understand the relationship between pollen, weather and allergic reactions, including thunderstorm asthma. Dr Lampugnani says this survey came about through necessity, but has grown into an extremely valuable data set. "When I built the app, we submitted it to the Apple App Store, but they told us it needed to be interactive in order to be accepted," says Dr Lampugnani. "We thought that our users could help us better understand how their symptoms relate to environmental factors and in so doing contribute to the development of an allergy forecast system. "Now hundreds of people log in every day to report their symptoms, and we've collected data on hay-fever symptoms from 80,000 people. "People have shown, by their participation, that our research is important and we are now working on allergy forecast models so we can better help the community."